By now you must know that I am obsessed with jackets. Wearing one really is a great way to offset and compliment an outfit. Not to mention keep you warm during fall’s fluctuating temps. I love that tweed can be worn a number of ways from the office to going out, and the embellished versions available now look very dressy and demure. I am quickly becoming a fan of the leather jacket. Not only has it been a garment symbolizing cool, from James Dean to Joan Jett, the tough exterior really creates a great contrast to the frilly, girly dresses and outfits that I love to wear. Lastly, the equestrian jacket, which remains a staple for lines like Ralph Lauren, and pops in and out of mainstream retailers. The best part of the equestrian jacket is that it is so flamboyant you only need it and some very subtle accompaniments to wear it. It is the statement. And fall is the best time to wear this hunting-inspired piece. Ooh, nice! It makes me quite happy that I didn't get rid of an old J. 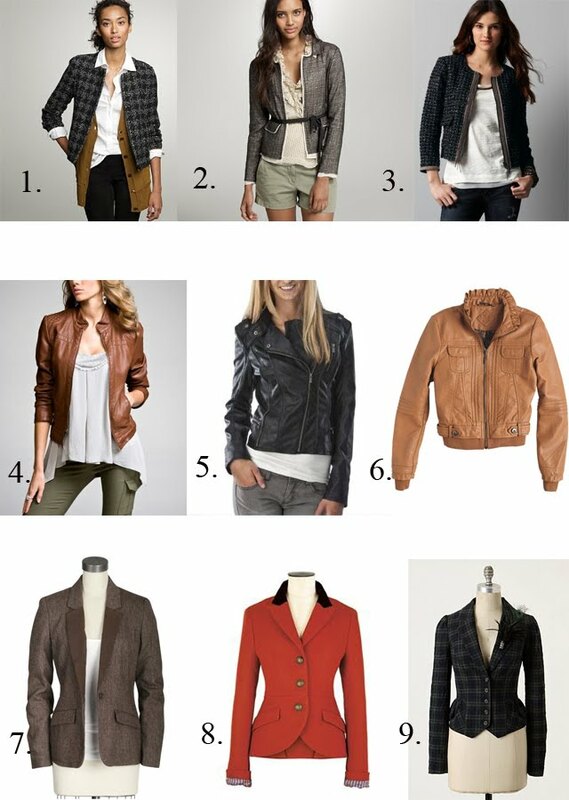 Crew jacket that looks like a hybrid between number 4 and 6 here!